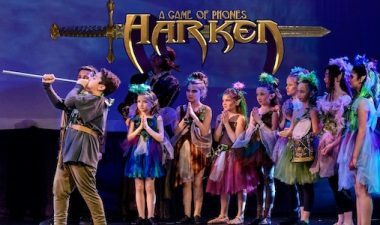 Harken – A Game of Phones Lets Audiences decide on the action! Have you ever been to a play and wish you could tell the character, no don’t do that, do this? That’s exactly what audiences can do in HARKEN – A GAME OF PHONES. This original fantasy adventure, written by Ryan Long, of Riddlesbrood Theatre runs November 3rd through 5th at Dennis Flyer Theatre, Camden County College. In Harken, a group of ordinary people attends a street fair where they’re transported into a fantasy world where they must fight their way to get out. The audience helps guide them through by interacting with their smartphones! They download a software AP and vote to determine the course of action. The set is a 3D world created with technology normally used to make video games instead of a traditional set. "Each time you see the show it will be different," said writer Ryan Long. "The action will be different, different characters will win and make their way home. My brother and I were always Dungeons and Dragons fans and wanted to make a realistic show where characters don't know what direction they're taking. It took a while to develop and we've made a lot of improvements.It’s going to be exciting and fun!"